While you normally see train station clocks as wall clocks or two-sided clocks, there is a miniature market out there too. 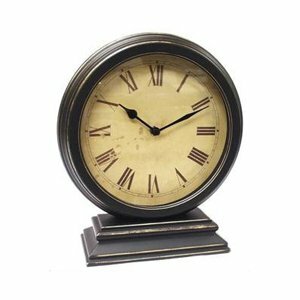 Railway table clocks and alarm clocks are a favorite for both bedrooms and offices alike. They’ve got that iconic train station fashion that makes them special. Many look very much like their big brother railway wall clocks, while others take a more creative bent. However you go, these are table clocks that are stylish and full of personality. See five of the best choices that you’ve got right here. They make great office gifts, and many are good as traveler’s clocks. The official Swiss Railway clock twists its style. Mondaine is the clock of choice for railroad clock buffs everywhere. Seeing as it’s the official Swiss railway clock maker, that makes sense. They make exceptional time pieces, and the modern edge to their famous design is appreciated by many. This table clock takes their design in a new direction. Named “The Globe Clock”, it’s a simple, but beautiful twist: The time piece is globe shaped. It’s rounded steel body complements the clock face with its circular second-hand tip. It’s a beauty, looking great in any modern office setting. Want to see it with a red case? Look here. Budget-friendly and modern in design. 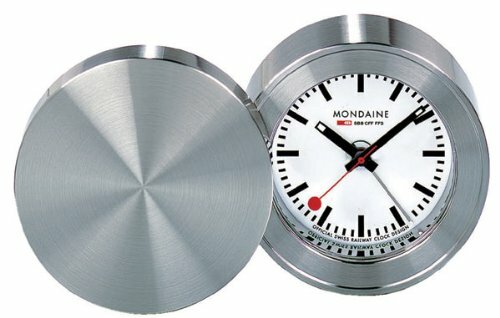 If Mondaine tends to be out of your budget range, a Karlsson clock is an excellent next choice. 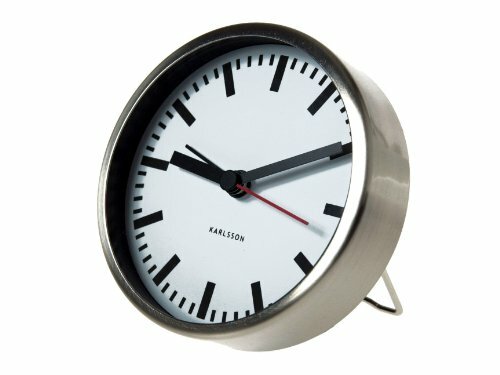 Karlsson makes exceptional clocks, and many take nods from the modern railway theme. Karlsson’s piece here particularly feels very much like a cousin to the famous Mondaine clock face. The white, black, and red face is as beautiful as ever, and you’ve got the additional value of this time piece being an alarm clock. The stand is removable too, making this an excellent traveller’s clock. It packs up quite nicely. Newgate clocks never disappoint in style. This is one of the more creative options in terms of train station table clocks. It’s got a very retro railway style. The foot itself makes it feel like it’s standing well above everything, sort of like the Grand Central Station clock that pulls together everyone’s travel schedules. While it may seem tall in the photo here, it’s really only seven inches in height. It’s one of those desk clocks that instantly add style to an otherwise boring office. It’s an alarm clock too, so for a retro or modern bedroom, this is tops for the side of the bed. Want to see it in black? Take a look. The perfect train station traveller’s clock. 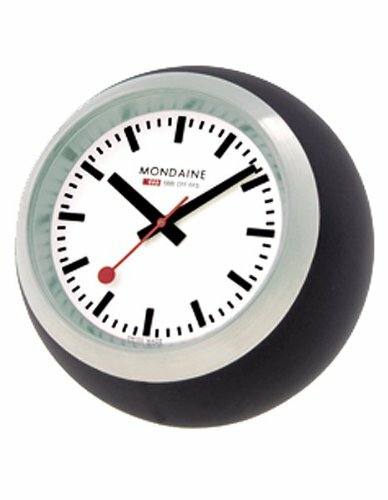 You saw the Mondaine Globe Clock earlier, now meet its traveling cousin. This is one top-notch bedside clock for those on the go. First off–it looks great. Simple, modern, and with a solid stainless steel case. It’s an alarm clock too, and the time piece itself comes with a carrying case to protect it during travel. Oh and it’s tiny. Five centimeters in width. That’s about two inches across. Meaning this alarm clock will take up very little space in the packing. A rustic desk clock beauty. 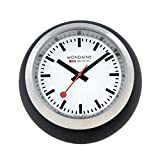 While modern table clocks are extremely popular, sometimes the best fit is a time piece that has a little more age to it. Or at least the appearance of age. This distressed clock time piece has the perfect amount of old-school to it. Sort of from a railway from a different time period all together. If you’ve decorated with a more classic style, one of these is a sure-fire winner to complement it.